ClickFunnels Affiliate BootCamp – 100 Day Challenge – Update 6 | Checking For A Scam, So You Don't Have To. Update number 6, they say as you get older time goes by much faster. Well, I have to tell you that this challenge is flying by. I really hope that if you decided to follow along that things are going well for you. There are a lot of moving parts here, but if you take it one step at a time you can and will do great. If? you have been following along you know how important Split Testing is. 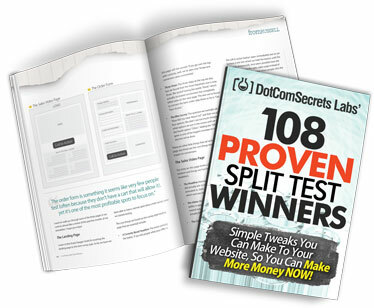 This is a free book with 108 proven split test winners. This can help you, of course when it comes to, you guessed it Split Testing. CLICK On The Book Below To Take Advantage Of This Offer, Cause When They Are Gone They Are Gone! Today we are going to start our second back end Funnel. This will make this more of a business and not just all about lead generation. The second back end funnel is going to add a second back end offer. Now your going to go to FunnelScripts and adapt that offer to your audience. You now need to pick the funnel type, landing page then directly to the sales page. The second thing you can do is to have the middle page, all together it would be three pages. The middle page or second page you would put a video explaining FunnelScripts then off to the sales page. Again, this is just an example. How to get all of your Sales Letters, Scripts, Webinars Slides Written in under 10 minutes. WITHOUT Hiring and Expensive Copywriter. He does recommend using the bridge page funnel. These are an example of what you can use for copy and then add the video like we said before. This is an example of what else you might want to put on the page. This even works if you hate writing and never wanted to know anything about copy writing. You are adding a true statement with FunnelScripts all you do is answer some questions and it really writes itself. The last thing to add to the copy would be something like this. Free webinar demo will show you, The New FunnelScripts Software That actually writes the copy for you! When, you add the word Software it makes people feel like it’s a program. That software actually performs an action, like writing the scripts for you. He also shows us how to use Ad Espresso this is something better off seen. To try to explain it here it will take a little to long. It’s easy just a lot of different ways to search for what your looking for. He is talking about the Soap Opera Series if you need to refresh you can look back to Day 8 that’s when it was introduced. The soap opera sequence is all about bonding with your dream customer. Your soap opera sequence is going to tell a story here is an example of the series. Walk-Through: Day 5- Urgency and C.T.A. Walk Through: Setting up your action funnel. family, it got so bad that I had to make a choice. No one person can run every aspect of the business there are way too many moving parts. You either need help by delegating responsibilities, or getting systems that will help you get the job done. FunnelScripts is one of those programs that will effectively help you do that. You can show the value in this program and how it helped you have time for your family. This is going to be about the Seinfeld Emails, we went over this on Day 12 so you can go back and refresh if you need to. You going to get the Seinfeld Email Worksheet it breaks them down to 3 categories. He goes into an explanation of each, a short one it’s not really long and its definitely not boring. It will give you some ideas for you emails. We are going to build the funnel, up to now he hopes you are paying attention to the numbers. Implementing the things that are working and getting rid of the things that are not. With this funnel he is recommending we use the bridge page. He is also going to show us how to make unique funnels from existing templets. This is what it comes down to, using the templets that exist then create unique funnels. We are going to be using the collect email funnel. It’s a two-page funnel and we will be using a bridge page so that will be perfect. Then he goes through showing you how to build it from scratch. He is showing us how to find the colors that were used on the original add. This is to copy the landing page so all pages will have the same colors. You now go look through the templets to see which one your going to use. He goes on to show us how to build the pages. This video really needs to be watched I would not be able to explain it to you with no pictures or videos. We are working on our Preframe, the preframe is created through the script you learned. Through the Who, What, Why, How script. Back on Day 10 we went over this there is a worksheet there that you should print out. On Day 15 we went into more detail so you can refer back to that worksheet. Then he goes over the questions from the Day 15 worksheet. These are the questions. Recap Your Offer/What, Why, How Your Offer Is All About. Make sure you know the laws where you live, like in Canada you have to be very specific that they are going to receive marketing messages, through email. There may be more and they may differ from locations so know the rules where you live. Facebook Ads – Your trying to send to people you don’t know and don’t know you, but you are sending them to this amazing offer. People That Are Already Using Copywriter Software. We are also going to be talking about our Dream 100, we are going to be taking people that already have some Copywriter Software. The ones that love it and we are going to take them to a much better offer. Now you go to Google and look up different copywriter programs. He is going through the Google search and coping down different software/programs for copywriters again he explains as he is going along another that you really have to hear for yours self. You want to at least have had 100 visitors to change any items of the funnel. You want to review all the data and keep it up to date. The reason for this is to see what is going on with your funnel. You need to know so that you will know what to change in your funnel. He is using the spread sheet we worked on from earlier in the process. You should have 2 different sheets one for the script and the other for the ad. Your putting in information like how many clicks on the link, what is the cost per click things like like. It is very important to keep track of your progress so you can fix what is not working. Also, you don’t want to change things that are working. There you have it the last 7 days of what we learned. You can still join! You will have these updates to refer to as well as the program it self. This is FREE to sign up and no credit card required. Thank you for following this 100 Day Bootcamp Challenge, I hope you are well on your way to making money!